With its interlocking circle design and four chandelier bulbs; the Winthrop Chandelier is as unique as it is beautiful. 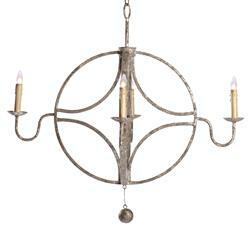 Crafted from iron with an aged metallic finish this chandelier is a perfect addition to the home. This item is UL approved.